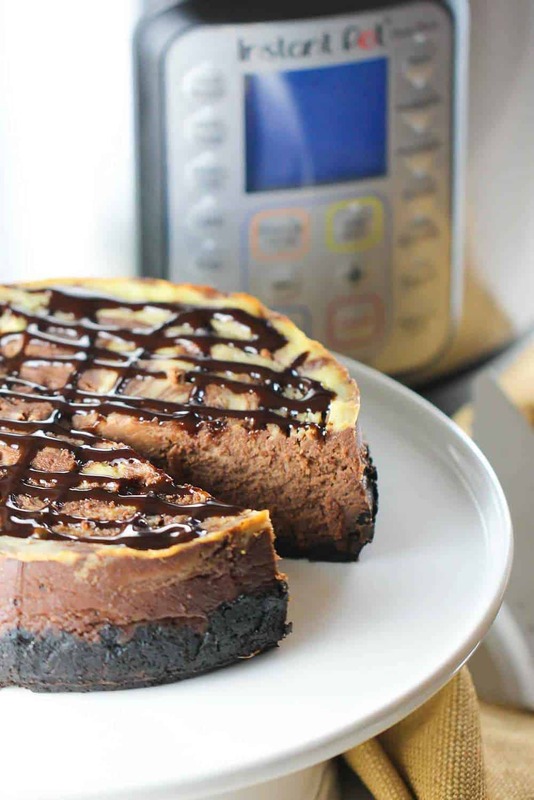 This Instant Pot Chocolate Marble Cheesecake recipe may be our favorite IP dish to date! You can not believe how the Instant Pot creates such a lush, creamy cheesecake!! 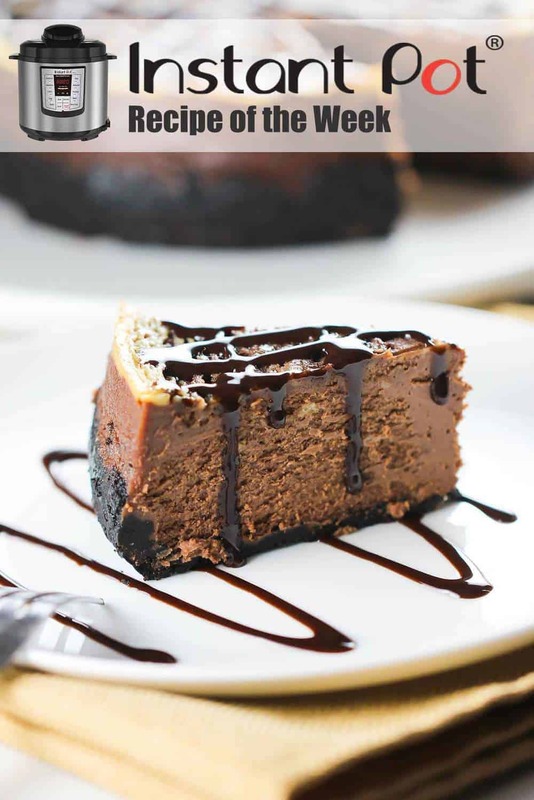 Everything about this cheesecake, from the super chocolatey crust, to the super chocolatey filling, to the super gorgeous presentation is just fantastic. 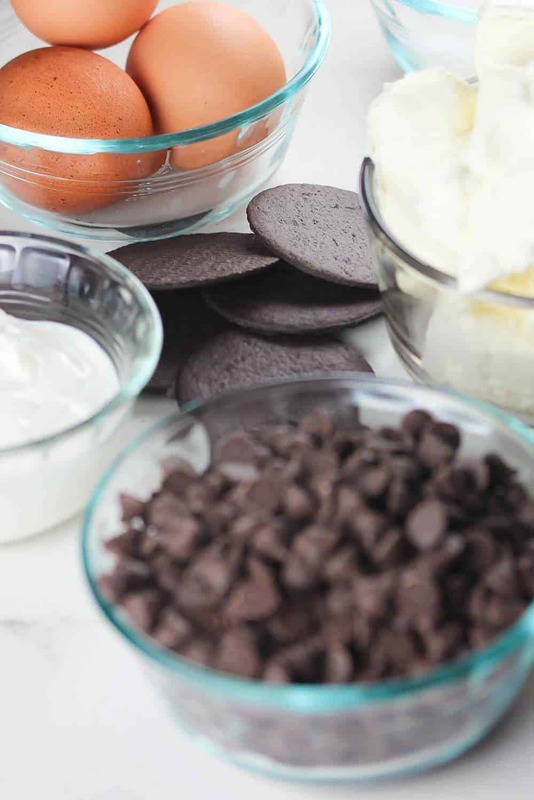 Classic cheesecake ingredients…made in your Instant Pot! When I started playing around with various recipes for a chocolate cheesecake, it took me about about 4 tries and a lot of tweaking, until I found what worked best. The Loon says this is about as good as any cheesecake he’s ever had…and he’s tried quite a few!! And I was not sure if I was going to like a slightly smaller cheesecake than the usual 9-inch diameter. But, actually, it’s the perfect size. 7-inch springform pans can be a little difficult to find, but you can order them really easily here and have them delivered to your doorstep in no time at all! Did I mention how easy and delicious this cheesecake is? I did? Well, let me say it again! This is so easy and so incredibly delicious. Compared to traditional cheesecake baking, the Instant Pot version is really fast, but, you still need to let the cake fully set while in the fridge for 6 hours, or even better, over night. So, plan accordingly. 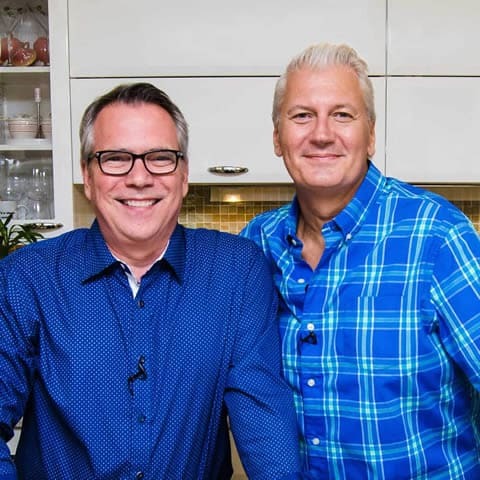 Easily make this the day before you want to serve, and then be ready to impress! 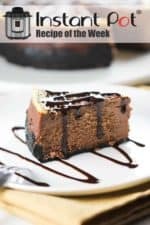 Now, go ahead and make this amazing Instant Pot Chocolate Marble Cheesecake recipe! 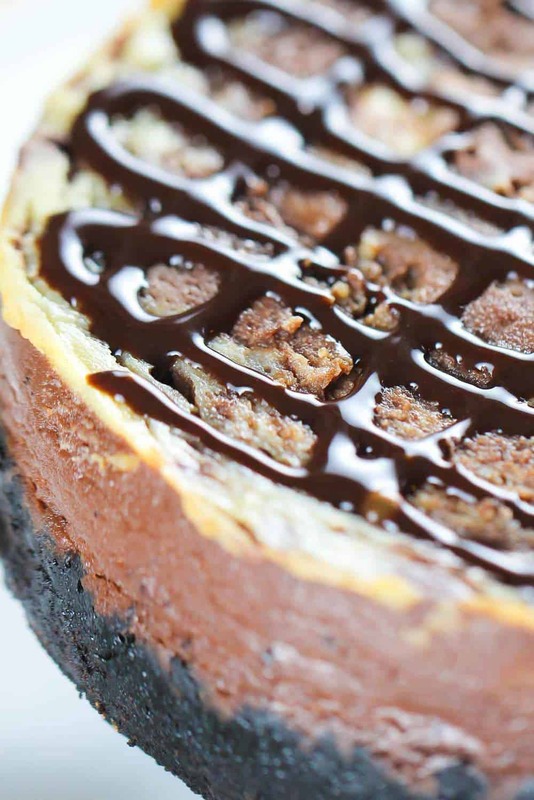 This Instant Pot Chocolate Marble Cheesecake recipe is definitely a keeper. The IP makes the filling so incredibly creamy and just so delicious. This is a chocolate lovers dream cheesecake! It takes a minimum of 6 hours to set in the fridge, so plan accordingly. But once it's ready, you and your guests will be so happy! Cut a piece of parchment paper that is the size of the bottom of the 7-inch springform pan and place in the pan. Spray the parchment paper and the inside sides of the pan with cooking spray. Process the chocolate wafers in a food processor until fine, or place in a large baggie and crush with a rolling pin. Add the crushed wafers to a small bowl and add 1 tablespoon sugar and the melted butter. Stir to incorporate. Press the crumbs evenly on the bottom of the springform pan and up about 1 inch along the sides of the pan. Place in the freezer while you prepare the filling. In a medium microwave-safe bowl, melt the chocolate chips on high, stirring every 30 seconds, until completely melted. Set aside. In a large bowl, use an electric mixer on medium speed and beat the cream cheese together with the 3/4 cup sugar until smooth and fluffy (about 2 minutes). Beat in the sour cream and vanilla. Remove 1/2 cup of the cream cheese mixture and place in a small bow. With the mixer on low speed, pour the chocolate in and mix thoroughly. Dollop the reserved cream cheese mixture across the top of the of the cheesecake and use a knife to swirl the cream cheese mixture with the chocolate mixture to give a marbled look. Tightly wrap the entire pan in aluminum foil. Using another piece of foil that is 24 x 3 inches long and make a 'sling' by folding it in half, length wise, and then fold in half two more times. Place the steam rack (that came with the IP) into the Instant Pot and add 1 1/2 cups water. Place the cheesecake on the sling and use the sling to lower the pan onto the steam rack and gently fold the sides of the sling over the top, careful not to press into the cake. Lock the lid and press PRESSURE COOK or MANUAL and cook on HIGH PRESSURE for 55 minutes. Use the QUICK RELEASE method to vent the steam (be careful of the escaping steam), and then open the lid once finished releasing. Use the sling to lift the pan out of the Instant Pot (be careful, it will still be hot). Remove the foil and let cool on a rack for 30 minutes (the center will still seem wobbly at this point). Run a knife around the edges to loosen the cake from the pan and remove the sides of the springform pan. Serve with chocolate sauce, if desired. How tall is your 7″ springform pan? I’m worried mine isn’t deep enough. I have just acquired an Instant Pot and have seen your delicious chocolate marble cheesecake recipe. Unfortunately we can no longer get Nabisco chocolate wafers, and I wonder whether you could suggest an alternative (together with weights) please? I am sorry but I don’t know how old your recipe is! Merry Christmas!